Test your skills in a unique VR racing experience inspired by classic slot-car toys. 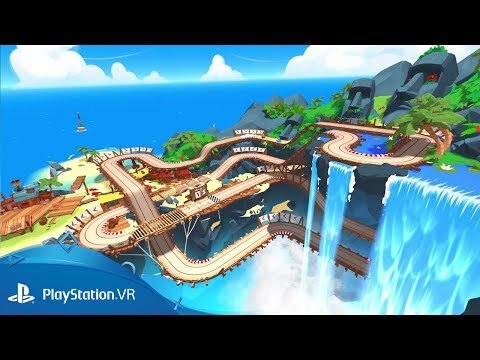 Pull on your PlayStation VR headset and wade into a dinky destruction derby that channels the chaotic fun of retro slot-car playsets into the immersive world of virtual reality. Loom over the racetrack like a titan and keep a keen eye on your car as it twists, vaults and loops around a range of gravity defying tracks - from tropical beaches and hidden pirate coves to frozen mountainsides and futuristic space ports. Follow the action wherever it goes, dipping your head underwater to race through a set of twisting sea-bed chicanes or angle yourself beneath a precarious jump to ensure you get the perfect take off. Stood amidst the madness, with the track festooned about you, get close to the action and watch the rocket-power miniatures whizz past your nose as you judge the perfect bend.